Yesterday morning, some friends and I attended the sessions of the Senate Banking Committee. 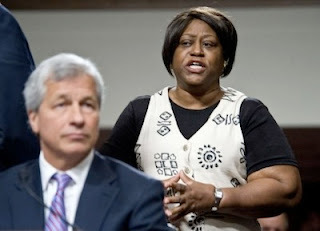 We did not intend to get arrested; we just wanted to have a word with Jamie Dimon, the man who leads the corporation that is trying to throw our friend, Deborah Harris, out of her home. When Deborah learned that Dimon, the CEO of JP Morgan Chase, was going to be in town to talk before the Senate Banking Committee, she felt that she could not pass up the opportunity to speak to the man who is responsible not only for the unjust foreclosure of her home, but of the devastated lives of so many families that relied on JP Morgan Chase's financial integrity. Several of us from Occupy Our Homes DC felt that we had a responsibility to accompany Deborah, and to stand with her as she spoke truth to power. For me, accompanying Deborah in her visit to the Senate Banking Committee was not about "protesting." It was not about a cathartic release, nor did I feel much need to have my voice heard. But it felt deeply important to me that Jamie Dimon, a man insulated by immense wealth and privilege, be allowed to hear the voice of one woman whose life is being turned upside down by the predatory practices of JP Morgan Chase. I was there to hold Deborah in prayer as she bore prophetic witness to the abuse of authority and public trust that Jamie Dimon represents. The consequences for our actions were swift. We delivered a message to those who sit in authority, and the hand of Authority was upon us immediately. We expected to be warned and asked to leave, but instead found ourselves roughly escorted out of the chamber and handcuffed. We spent the next seven hours being confined to small spaces - a police van, narrow benches, jail cells. We were moved between different rooms incessantly - in my case, I was probably transferred to a different location at least fifteen times. I was literally chained to the wall for much of my stay. I was surprised by how traumatizing the experience was. Though I did not expect to be arrested, I assumed that this kind of "political crime" would result in a brief trip to jail and a quick release after paying a fine. Instead, we were held for most of the day. My case was particularly stressful, since the FBI computer mistakenly identified me as being a certain Mr. Perez. I was repeatedly interrogated by my jailers as to my real identity, threatened with prolonged incarceration and locked away for long periods of time while I waited to see if they would confirm that I was really me. It looked like I might face an extended stay in jail. With my wrists locked in steel and my every movement controlled, my mind was drawn repeatedly to Paul's writings about powers, principalities, authorities, thrones and rulers. Without a doubt, I was in the power of the men and women of the Capitol Police. They could do anything they wanted to me, and I had no ability to resist. As someone who is accustomed to having some measure of control over his own life, this was a difficult experience for me. For most of the day yesterday, I was reduced to a number and an object, and my very identity was called into question by multiple interrogators. Added to this was a prolonged period of involuntary fasting. I felt numb, empty and increasingly distant from life beyond the jailhouse walls. At about six hours in, the officers finally decided that I was indeed who I said I was. At that point, they started calling me "sir" and relating to me as a human being, rather than an object to be moved, recorded and stored. They also let me call my wife, which was a great encouragement. She told me how proud she was of me, and that the media was really covering our action at the Senate hearing. It was good to be reminded again that this was not about me; it was about Deborah and others who are being trampled by the super-rich and their machinary of insatiable greed. Finally, I was released. To my amazement, it seemed like my jailers really wanted me to thank them. One of them remarked, "we treated you very well." I was too shell-shocked to respond, but I thought to myself, "I would hate to see what you do when you decide not to treat someone well." I did not have it in me to argue with them at that point, but by no means was I going to assuage what I interpreted as a nagging feeling of guilt on their part. Let them sit with it. As I was leaving, several people called the station, asking about me and calling for my release. The officer in charge spoke to the last person saying, "could you please tell everyone that Micah has been released? We have been getting calls every minute!" I felt so grateful for the support that my friends showed - and to know that the pressure would have only increased if they had held me longer or transferred me to another facility. But - once again - this is not about me! I would not have chosen to be arrested, but I hope that by telling the story of my ordeal I can once again draw attention to the plight of so many families that are being forced out of their homes by the Big Banks. If you have not yet, please learn about Deborah Harris' case, and consider how you might be able to take part in the movement for justice. If this incident can help build greater support around Deborah, I will be satisfied. Finally, I must give glory to God. The experience of being incarcerated was an amazing opportunity to lean on Jesus. While other human beings had absolute authority over my body, the only freedom that remained for me was in my spirit. As I was chained to walls and locked in a cell, my connection to God was the only thing that could cut through the anxiety, claustrophobia and sense of helplessness that I was experiencing. I know that the Lord will not present me with any challenge that he does not also equip me spiritually to endure. heart and my portion forever. Many thanks for your accompaniment of Deborah and sharing your experience publicly. It is certain revealing that the Jamie Dimon's of the world and the rest of the people that caused untold economic distress from 2008 until now are treated well and not prosecuted but as soon as a victim speaks up "inappropriately" the heavy hand of "justice" comes down hard on those trying to speak truth to power. I would venture to guess that the police officer you were dealing with who said how well they treated you was probably not dealing mainly with his guilt (which they should have) but making a preemptive strike to try to convince you that they really did treat you well in their eyes and the eyes of the system so you would not formally complain about your treatment after you were released. I hope to be able to do some work with you good people in regard to your mortgage foreclosure actions. I had set up a mortgage foreclosure avoidance assistance group at my parish in 2008 to help folks who were in danger of getting foreclosed get as much assistance as they could in preventing that movement. Unfortunately, we ended up disbanding after about two years but it has always been in the back of my mind that I would like to get involved with some foreclosure resistance, the type of which Michael Moore documented in Capitalism - A Love Affair, and which it seems like you were doing to some extent with Deborah. Micah, Thank you for your witness and this account. I have been arrested more than a dozen times on Capitol Hill in various nonviolent direct actions, at different times and places. Those in power do not want to hear words of truth and be confronted with the true life stories of those victimized by corporate-government policies. Often when I have been detained for many, many hours -- a few times I have been held over 30 hours in various cells -- I remind myself of the young men and boys who were and a few still are being held with no trial in places such as Guantanamo. Your support of Ms. Harris is greatly appreciated, and I am overjoyed by the good work I see Occupy Our Homes - DC doing in my hometown. Thank you! Actions like this are the essence of following the teachings and example of Jesus in my opinion... very inspiring. Thank you for your actions and for your story. Say Micah, if it's not all about you, why not share Ms. Harris' story and narrate some of those great pictures of her. I like that this is an "experience near" narrative. It speaks loudly about justice. Millennials: Shake Off the Shame! Pope Benedict XVI Resigns: What Does It Mean? Should We Give Up God For Lent? © 2012 Micah Bales. Watermark theme. Powered by Blogger.